The Fender Classics - Reissue Pedals include the Fender Blender (octave/fuzz), a Volume, a Volume/Tone, a Phaser, and the Fuzz-Wah pedal. In this test we’ll be taking a look at all of the above with the exception of the Fender Blender. At first glance these pedals look vintage: robust, big, and heavy! And they are heavy! Though made in Korea, there’s nothing cheap about these pedals. If you buy all five you’ll probably have to end up getting them their own separate pedal board. Just incorporating one or two into your existing pedal board will require some measurement and planning. But in look and feel, they certainly live up to their vintage counterparts. As for packaging, there’s the strict minimum, but in style. They each come in a chic black velour stocking-like cover, complete with an embroidered Fender logo (It would look great next to the fireplace for Christmas if you don’t use it for anything else). The only other thing in the box (besides the Styrofoam) is a catalog of the other pedals in the collection. There’s no manual, and you don’t need one. It’s basically intuitive plug-and-play. There’s a minimum of knobs on all of the pedals with an emphasis on foot controlled parameters. The Fuzz/Wah and Volume/Tone feature clever dual action treadle plates that not only rock forwards and backwards like a traditional wah-wah, but also move from left to right. And the Phaser has a big back-lit rate control knob, that alternately illuminates blue and red at the same rate as the phase shifting, that can easily be manipulated with your foot. Let’s take a closer look at their ergonomy and see (and hear) how they sound. There’s nothing really fancy about a volume pedal, and you basically just want it to do its job, and do it well. With this pedal, that’s what we get. A simple streamlined (though heavy) pedal that’s very efficient at controlling volume. It uses passive circuitry so there’s no battery needed and it only has an input, output, and a tuner out. That’s all you basically need. It should be noted for those who care about these things (I’m thinking about our pedal steel friends), that only the input is on the right side of the pedal, leaving the two outs on the left side. This small detail may or may not be convenient for certain setups. Because the pedal uses a passive Tone control circuit, it of course works best when connected directly to a passive guitar. If you use an active guitar or put other pedals before this one, Fender says the output impedance of the active device should be 10k ohm minimum for best performance. The input impedance is 250 kOhm and the output impedance 0 to 62 kOhm depending on the pedal position, naturally. Being a guitarist who uses volume pedals quite a bit, I was pretty interested to see how this one would stack up against my Ernie Ball. My first impression was one of solidity. This thing looks and feels robust! With its all metal-chrome aspect (except of course for the foot mat) it looks and feels sleek and solid. As I’ve said already (and I haven’t finished saying it) this thing is heavy, even for a volume pedal! But although it looks very bulky, it’s in fact no more bulkier than my Ernie Ball. 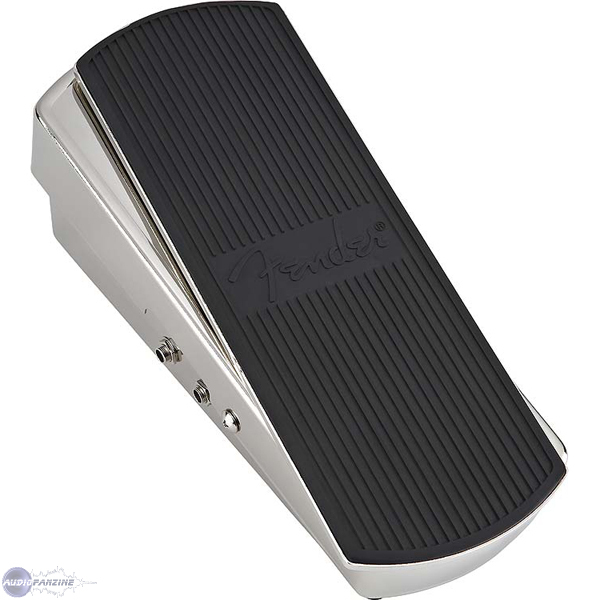 As far as sound goes… It’s exactly what a volume pedal should be: transparent and noiseless with a smooth volume taper. There’s certainly no need for a manual here. The thing fulfills its function perfectly. There’s no sound leakage when the pedal’s at zero and the volume transition is super smooth, with no noises. Here are a couple of examples of the Volume pedal with lots of delay. Also check out the video for more examples. This Phaser delivers great sound with just a few knobs. The Rate control (the main feature of this device) is a big flat knob (more like a big dial) that naturally controls the rate at which the phase shifting occurs. The interesting thing here is that the rate control knob alternately illuminates blue and red at the same rate as the phase shifting. And because this knob is placed in relief at the top of the pedal, it can be adjusted with your feet by just stepping on it and rotating. It looks really cool and sounds great too. The other two knobs are side mounted: Intensity- adjusts the intensity of the phasing effect and Frequency - adjusts what frequencies are affected by the phasing action. Turning the latter fully counter-clockwise causes the bass frequencies to be affected most by the phasing action while fully clockwise causes the treble frequencies to be most affected. As for other specs: the on/off switch is in "true-bypass". The Phaser runs on a 9-volt battery but can be powered via an adaptor (not included). Input/Output Impedance is 470k/4.7kOhm respectively and Recommended Load Impedance is 50kOhm or greater. As stated before, this pedal sounds great. It has a unique sound amongst phasers and can be quite subtle when you want it, but also get those crazy phaser sounds. Even people who don’t usually use phasers or think that they don’t go with their style of music might be pleasantly surprised by this pedal. When adjusted to subtle settings the pedal adds a kind of liquid warmth to the sound without being distracting. On the other hand an almost Leslie-type of sound can also be achieved if desired. There are, however, a couple of issues. First off, did it have to be so big and heavy? It’s definitely robust (like the other pedals), but it’s almost as big and certainly as heavy as an average volume pedal! Another issue is the side-mounted knobs: they’re not easy to adjust to say the least. They’re imbedded into to pedal to no doubt protect them, and while this is perfectly valid, it doesn’t make it easy to tweak them, especially in a live situation and especially if you have thick fingers like myself. And the last issue concerning this otherwise wonderful phaser, is a certain amount of noise coming from the pedal. There’s a slight ‘’purring’’ that can be heard that coincides with the phasing effect. When all settings are at full and your amp volume is turned all the way up, it sounds almost like an idling Harley Davidson. It’s pretty annoying when at high volume. Despite these issues, the pedal is a real joy. It really sounds great, and the lighting effect, in addition to serving the function of showing the phase speed, is quite nice. Plus being able to adjust this speed with your feet is a real asset. Too bad they didn’t think to do the same with one of the other knobs. The pedal is certainly big enough to fit another big flat dial, but maybe that would be asking too much and not in keeping with the original model. This one’s the heaviest of the lot, but it does contain two pedals in one, after all. It too is very straightforward in design with no knobs and very few settings or switches. 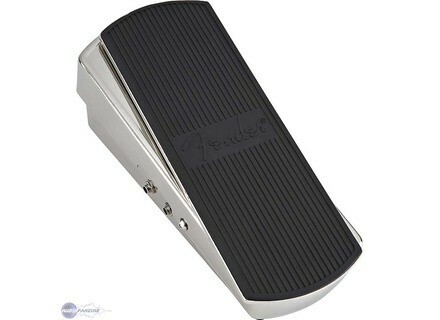 Like the Volume/Tone pedal, it has two-way control: tilt the pedal back and forth to control the Wah, and rotate the pedal left and right to control Fuzz level. There are two stomp switches on either side of the pedal to activate the Fuzz and/or Wah. There’s nothing else in the way of foot controls. Under the pedal is a switch that changes the effects order (it switches the order of the effects: Fuzz -> Wah or Wah -> Fuzz) and a Fuzz volume adjustment (adjusts the volume level of the Fuzz so that you can match the volume level of your guitar when Fuzz is turned off or set it up for a boost). As for connections, there’s only an input, an output and a DC Adapter (not included ) input. This might seem a little too straightforward for some, especially when considering some of the features included on some modern Wahs, or even Fuzzes, but for some reason it doesn’t feel like your missing anything when using this pedal. You can get a lot of different tones by just using the foot controls. The Wah, though maybe not the widest in scope, sounds great and much more natural and musical than most Wahs I’ve heard (especially newer ones). It’s tone variation is super smooth and the pedal doesn’t move if you leave it at a certain angle. Plus I found that just activating the Wah and leaving it at a certain angle (especially all the way up) gives you some very nice and useful tones (especially when coupled with the Fuzz). This isn’t the case with many Wahs which, when not being continually rocked back and forth for that typical wha-wah effect, sound extremely nasal or piercing when left on, in any position. As for the Fuzz, it too sounds great and you can get quite a bit of expression with the left-to-right foot control. It certainly sounds vintage and you’ll find yourself getting in some Hendrix, and Cream licks. The Fuzz level adjustment on the bottom of the pedal is useful for getting just the right volume level when you activate the Fuzz. It’s too bad that this can’t be controlled in an easier fashion, such as a knob that could be adjusted with one’s foot. It’ pretty hard to adjust as it is, since it’s imbedded and you’ll need a thin hard object, like a very very small screw driver, to turn it. Definitely could have been easier! The effects order switch is much easier to use (just a normal switch) and is very effective for changing the sound of the pedal. As for downsides to the pedal, there aren’t many. It’s weight and Fuzz-volume adjustment issues have already been mentioned. The pedal will definitely take some getting used to in the beginning due to the fact that one tends to forget which direction (up/down or left/right) controls which effect, but this isn’t really a downside. Also, because there are no LEDs indicating whether an effect is activated or not, you can get off to many false starts. I also found it tricky to actually stomp on the switches at first since they’re slightly lower than the surface of the treadle and therefore need to be stomped on at a certain angle, especially if you don‘t want to alter the angle of the treadle (wah level). Check out the video for more examples. Made in Korea with Californian know-how, these vintage re-issue pedals give the best of both worlds: quality products at a relatively inexpensive price. They might not have many fancy settings or adjustments but they definitely deliver the goods. They do however have a somewhat fancy look to them with all that shiny chrome; all except the Phaser, but the Phaser has that cool synchronized back-lit dial. Though they’re heavy and bulky, they do look, feel, and above all, sound vintage. There are a couple of details or features that could have been done differently and one or two downsides, but on the whole they’re a great addition to anyone’s pedal collection. And considering that they’re fairly inexpensive for such quality Fender products, there’s not much of a reason not to run out and test and eventually buy one, if not all.